Does badger culling make economic sense? This looks at the economics of culling badgers based on how much is spent on bovine TB in Great Britain each year and what was achieved in terms of TB reduction in cattle during the Randomised Badger Culling Trial (RBCT). According to a DEFRA Freedom of Information reply1 dated 09 May 2014, TB in Great Britain costs about £100 million pounds each year. Your request covers two financial years which are 2012 to 13 and 2013 to 14. 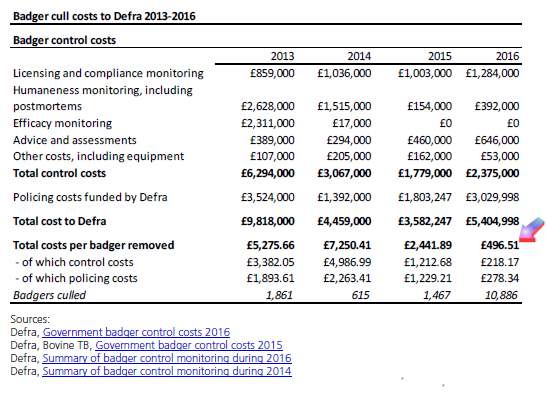 Forecast expenditure on the bovine TB programme for the current financial year (2013- 14) is just over £99 million, excluding Defra policy development costs. That is after taking account of EU funding of around £12 million, which is as yet not guaranteed. According to statistics on TB in cattle released by DEFRA each month about 3,300 new herd incidents which resulted in OTF status being withdrawn (simply referred to as TB incidence below) occurred in 2013 and 2014 in Great Britain. This means each incident cost about £30,000. The above graphs show that incidence in the subject and survey areas leading up to the start of culling in 1998 closely overlaid. If it is assumed that any differences were largely due to sample error, which cannot be adjusted for, it is appropriate to calculate the number of incidents prevented by simply subtracting the number of incidents in the survey areas from the number in the subject areas. Between 1998 and 2012, in the combined proactive treated area and outer 2km ring, the sum of incidents recorded in the raw unsmoothed data supplied by DEFRA reveals that, relative to the sum in the combined survey-only areas, 2706 - 2378 = 328 incidents were prevented. 1,132 km2 was the overall encompassed treatment area, of which 797 km2 were accessible for treatment. Hence if each incident costs £30,000, the benefit per km2 of treatment area was 30,000 * 328 / 1,132 = £8,692.58. According to data extracted from the RBCT Final Report5, at the end of the RBCT trial, 8 badgers had been removed per km2 of treatment area. £4,000 + £2,000 = £6,000. Regarding payments made by landowners, landowners are being charged according to acreage and number of cattle kept. For a landowner who intensively grazes his/her land, the cost will typically be just short of £2000 per km2. An arable farmer will obviously be charged less because there will be no charge due to stocking. Hence, the £6,000 quoted above is considered to be an upper limit. Hence, if it is assumed that the culls in the 2013 campaign will deliver the same benefit in terms of TB incidence reduction as in the RBCT, removing badgers in the 2013 campaign is expected to return a saving of about £2,700 per km2. The number of badgers removed to-date (as of April 2018) in each area of the culling campaign which started in 2013 is shown in Fig 469 of Reference 6. That figure is shown below. See Reference 6 for references to data sources. If the size of the badger population in today's High Risk Areas and weight of infection in that population has not changed since the RBCT, assessing the economic case for culling badgers today is easy. In such circumstances, if a similar number of badgers are removed as in the RBCT, today's badger removal operations are expected to make significant savings and the campaign to remove them makes good economic sense. However to compensate for any badger population growth and still ensure a good saving, the number of badgers removed per km2 may need to exceed the number removed in the RBCT. Obviously, if numbers removed fall significantly short, and the population has grown, the economic case becomes less certain. Bovine TB Control Costs. RFI 6505. DEFRA. 09 May 2014. Description of RBCT data supplied by APHA on 15 March 2016. ATIC0693. Download of RBCT data supplied by APHA on 15 March 2016. ATIC0693. Badger Culling in England By R Giesler et al. House of Commons Library. BRIEFING PAPER Number 6837, 12 April 2018.